Ah, good Akatsuki no Yona is back and it feel really great. The very, very, very slow-winding spool of the past few episodes is finally start to spin out, fast enough that the episode truly flew by, leaving me cursing when the ending credits rolled at the cliffhanger. Curse you, Akatsuki no Yona! You think you can slouch through three or four consecutive episodes and then suddenly ramp up your pace to the fastest it’s been all show & expect me to just go along with you? Well, I did, but I’m still a bit grouchy. But a good grouchy. Grrr. I’ll admit, I was a bit worried at the start of the episode. Starting off with yet another recap of moments we’ve already seen? Great, it’s going to be another super slow episode. But, instead, Yona went for the fireworks right out of the gate by letting us (and Yona) see Yan Kumji up close for the first time. While I’ll admit the whole sexual threat thing got me a bit annoyed, Yun offering to take Yona’s place and shouting himself down internally was more than enough comedy to make up for it. Of course, then there were Yona’s eyes. It’s nice to finally get an episode mostly focused on Yona growing and actually doing things (as opposed to her just spending an episode on the edge of a cliff repeating the same phrases about wanting to be stronger). In fact, we’re seeing Yona grow stronger before our very eyes right now. You don’t get stronger just by wishing to be stronger; you get stronger when you push yourself beyond your limits, when you move forward despite your fear, and, most of all, when you take action at the exact moment that action needs to be taken. 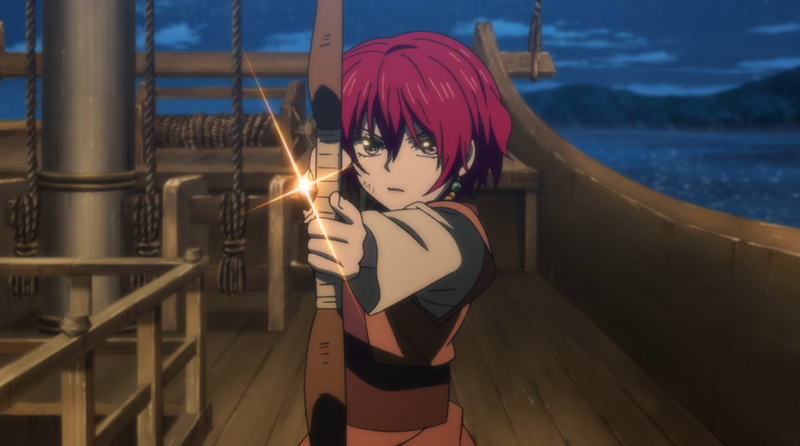 That is the sign of strength and that is exactly what we see Yona exhibit throughout this episode, not just when she appears on the ship’s deck to save Yun. It hasn’t been long since Yona was a princess in a castle, totally sheltered from the world—innocent, naive, and just a bit proud. So, her act before Yan Kumji, where she goes through the utterly humiliating and demeaning moment of pretending to be someone she’s not, offering to be her real self, ostensibly only for saving her own skin, it is a profoundly complex gesture of renunciation of all false pride. 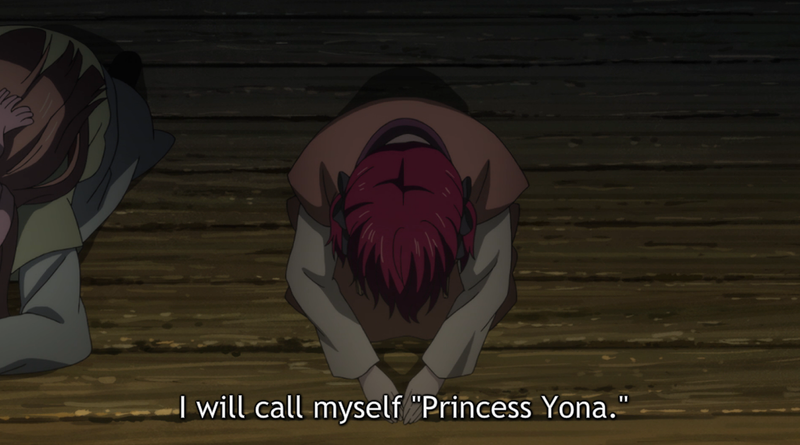 In that moment, Yona completely ceases to cling to the esteem of her royal birth for the sake of her plan’s success. As she prostrates herself before Kumji, her gesture of indignity paradoxically dignifies her more than any crown or title could possibly do. Yes, this is a princess with the strength to deny being a princess, all because she seeks to grow stronger, fight for those who cannot defend themselves, and protect the people of her country. Yeah, Yona bowing in front of Kumji was my favorite moment of the episode because it was so quiet and so subtly humble. Under the tension of the threat of discovery, the implications of that gesture don’t really play out in Yona’s head, but we hear Kumji’s thoughts for the first time as he disparages the real Yona for doing what his fake ideal of the princess could never do. The contrast Kumji’s image of Yona provides for the gritty reality of the injured Yona serves to beautifully exemplify just how far Yona has come. We, the audience, know that Yona is injured and constantly in doubt of her own strength, so we know just how brave she has just been. And we know Kumji’s Yona is a superficial and pathetic shadow of the real thing. And this launches Yona, it seems, into her impassioned pleas for the other women aboard the ship to fight for themselves and for their hometown. Yuri, the girl with the awesome hair who joins Yona and Yun in carrying out their plan, gives us yet another compelling reflection on Yona from the perspective of someone who barely knows her: “Only outsiders, or the strong, talk like that.” Indeed, these are both important elements in Yona’s journey. She is an outsider, not only to Port Awa’s struggles, but to the entire kingdom, and her desire to understand others (of which I’ve written before) is representative of an outsider trying to no longer be an outsider. And the strong, well…I don’t need to say much more on that one. But, in this case, it is Yona’s relationships with others that bring out the strength that has been so long developing. She has long spoken of protecting Hak, but it is when Yun is put into danger that Yona springs into violent action and her eyes burn, not with the fire of a seasoned warrior, but with the passion of a human being who has come to understand someone and, through that understanding, desire to protect them. But (and this is important) Yona doesn’t forget all in the pursuit of Yun’s safety. She dives for the firework and lights it off, not only acting, but succeeding in her plan. And that, my friends, I believe will be the force that lets the cork out of the proverbial bottle of the avenging angel Yona we were promised at the beginning of the show. A quick word about the cliffhanger: gaaahhhhhhhhh it hurt so bad. I was so ready for it. Ready for Hak and bloodthirsty Ki-ja (who is hilarious, by the way) and Sinha and (of course) Jaeha to explode into awesome action. 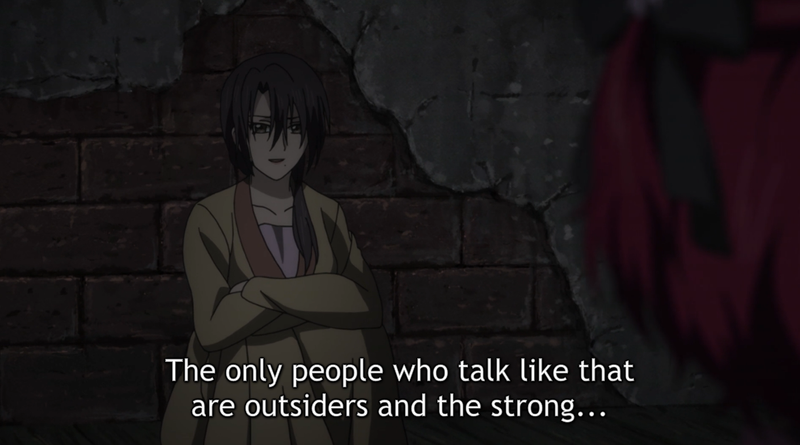 It was cool to see the gang fighting for the bit we got this episode (Hak, in particular, got some good cuts), but I’m ready to see them really go nuts on these bad guys. I’ve waited so long. Next week is going to be a party. Her intense gazes are the best. The kind that strikes fear into her enemy. This episode emphasizes a lot on this. I partly want to believe that it is purely by her sheer overwhelming will, and partly try to justify that it is because of her blood of the Red Dragon. Either way it’s awesome and she’s the badass Hime that we’ve all been waiting for. Yeah, the long hair covering only one eye look is better freaking awesome. 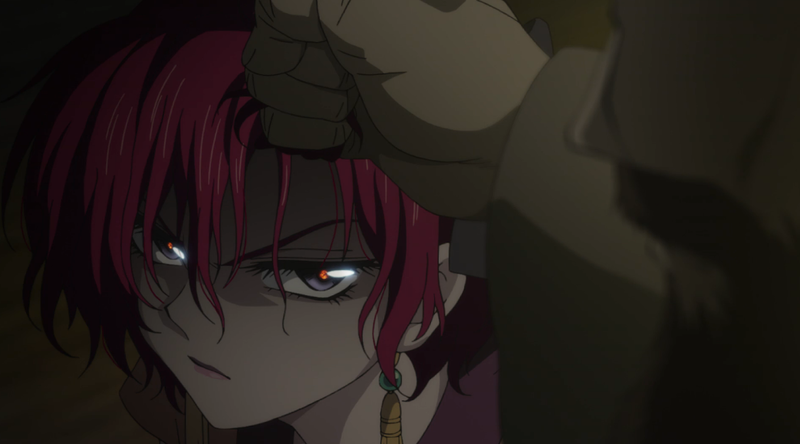 Yeah, it’s not totally clear to me if Yona’s gaze has some supernatural power or not. I’m kind of thinking it needs to, though, otherwise it’ll just become a plot device they can whip out whenever they need her to intimidate someone. And that just would be no good. Oh, boy, we’re getting another cliffhanger next episode? It can’t be as bad as this one, though. This one was like, “Are you ready for some crazy awesome stuff to go down?? ?” …and then ended. Yeah, Yona has a great cast of characters, which has done a really good job of pulling me through some of the slower parts of the show. If the characters weren’t likable or weren’t fun to watch, those slower moments would have been much more difficult to sit through.